The first direct evidence of white dwarf stars solidifying into crystals has been discovered by astronomers at the University of Warwick, and our skies are filled with them. Observations have revealed that dead remnants of stars like our Sun, called white dwarfs, have a core of solid oxygen and carbon due to a phase transition during their lifecycle similar to water turning into ice but at much higher temperatures. This could make them potentially billions of years older than previously thought. The discovery, led by Dr Pier-Emmanuel Tremblay from the University of Warwick's Department of Physics, has been published in Nature and is largely based on observations taken with the European Space Agency's Gaia satellite. White dwarf stars are some of the oldest stellar objects in the universe. They are incredibly useful to astronomers as their predictable lifecycle allows them to be used as cosmic clocks to estimate the age of groups of neighboring stars to a high degree of accuracy. They are the remaining cores of red giants after these huge stars have died and shed their outer layers and are constantly cooling as they release their stored up heat over the course of billions of years. The astronomers selected 15,000 white dwarf candidates within around 300 light years of Earth from observations made by the Gaia satellite and analysed data on the stars' luminosities and colours. They identified a pile-up, an excess in the number of stars at specific colours and luminosities that do not correspond to any single mass or age. When compared to evolutionary models of stars, the pile-up strongly coincides to the phase in their development in which latent heat is predicted to be released in large amounts, resulting in a slowing down of their cooling process. It is estimated that in some cases these stars have slowed down their aging by as much as 2 billion years, or 15 percent of the age of our galaxy. 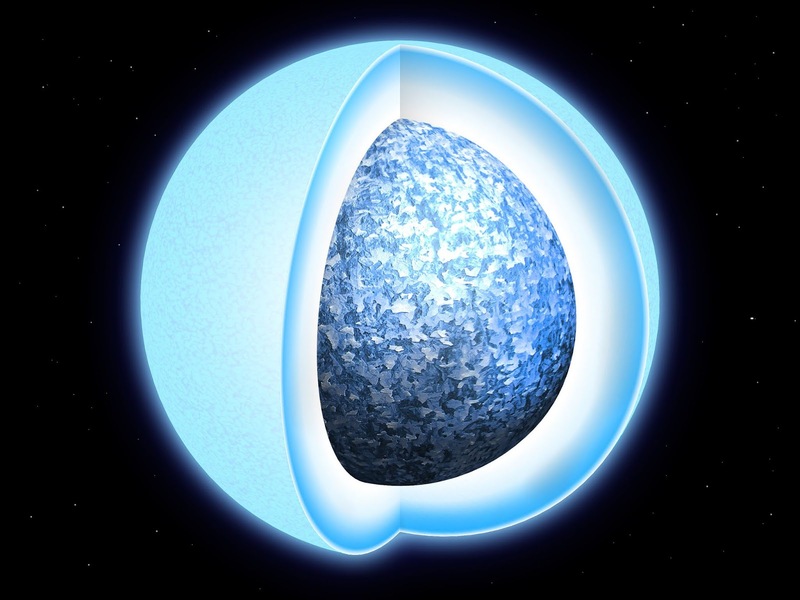 Dr Tremblay said: "This is the first direct evidence that white dwarfs crystallise, or transition from liquid to solid. It was predicted fifty years ago that we should observe a pile-up in the number of white dwarfs at certain luminosities and colours due to crystallisation and only now this has been observed. "All white dwarfs will crystallise at some point in their evolution, although more massive white dwarfs go through the process sooner. This means that billions of white dwarfs in our galaxy have already completed the process and are essentially crystal spheres in the sky. The Sun itself will become a crystal white dwarf in about 10 billion years." Crystallisation is the process of a material becoming a solid state, in which its atoms form an ordered structure. Under the extreme pressures in white dwarf cores, atoms are packed so densely that their electrons become unbound, leaving a conducting electron gas governed by quantum physics, and positively charged nuclei in a fluid form. When the core cools down to about 10 million degrees, enough energy has been released that the fluid begins to solidify, forming a metallic core at its heart with a mantle enhanced in carbon. Dr Tremblay adds: "Not only do we have evidence of heat release upon solidification, but considerably more energy release is needed to explain the observations. We believe this is due to the oxygen crystallising first and then sinking to the core, a process similar to sedimentation on a river bed on Earth. This will push the carbon upwards, and that separation will release gravitational energy. "We've made a large step forward in getting accurate ages for these cooler white dwarfs and therefore old stars of the Milky Way. Much of the credit for this discovery is down to the Gaia observations. Thanks to the precise measurements that it is capable of, we have understood the interior of white dwarfs in a way that we never expected. Before Gaia we had 100-200 white dwarfs with precise distances and luminosities -- and now we have 200,000. This experiment on ultra-dense matter is something that simply cannot be performed in any laboratory on Earth."